About | Carrara's Auto Clinic, Inc. 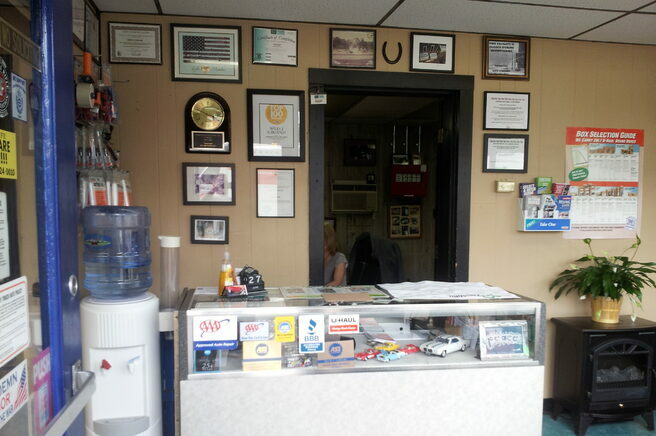 In October 1979 Dave Carrara opened the doors to Carrara's Auto Clinic with his father , Peter. In addition to a strong work ethic and uncompromising integrity, Dave also brought with him NIASE (the original name for ASE) master certifications, extensive experience and training from two leading Japanese car makers, Honda and Nissan/Datsun, and his passion for automobiles. Business included motorcycle sales and service until 1985 , which grew out of a significant AAMAR race effort where Dave worked as lead technician and his previous Honda motorcycle experience. Originally, the name of the business was Carrara's Auto & Cycle. As the businesses of motorcycles and automobiles parted ways and technology began to change at a rapid pace, constant education continued to be the key ingredient to providing outstanding value to our expanding clientele. A moderate tenure with Snap-On Tools as a trainer in the subjects of automotive electronics and engine performance helped hone Dave's competencies and keep him at the forefront of repair techniques . From 1998-2007, Dave's son Jay worked full time as a technician after completing a formal education at NEIT and growing up around the business. Continued investment in knowledge and technology have always supported integrity and quality workmanship, which have been the keys to the excellent local reputation the business still enjoys today. While Peter is no longer with us and Jay is pursuing other career opportunities, Dave's hard work and passion for the business continue to drive results for our customers. When you arrive for help with your vehicle's needs, you can enjoy an experience that is becoming more scarce in the automotive industry. Rather than a counter sales agent, service writer or receptionist translating your concerns, you always speak directly with the certified technician with 50 years of experience. Dave works with every client individually to provide an honest assessment of the car's condition and needs, as well as include each customer's concerns and budget. There are no surprises, and no misunderstandings. A much appreciated and rare personal relationship is built and maintained. Since 2007 Dave has received much help from Dianne Malcuit and you will find her on site everyday. Dianne brings her prior business experience, a B.A. in Business,and extensive HR background with her as she undertakes much of the customer service and non repair related business needs. While the cars, technology and motorcycles of 1979 are long passed, Dave is still very happy to be well qualified and enthusiastically continue to service any and all make, model, or design of car on the road today. If you need service and maintenance on your brand new car, or have some great classics (or both!) which you want cared for by someone with years "in the know" we are happy to be here for you. We are a family business, which means on most days, you are very likely to meet two 4-legged members of the family, Daisy and Casper. (Unless they choose to take a well deserved "personal day" off). They are both super friendly and our unofficial "welcoming" team. 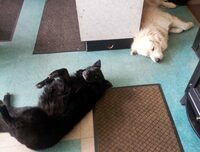 This is generally how you will find them when you enter the office! Thank you to all of our friends who expressed their sympathy for our recent loss of Sebastian. It is truly appreciated! the business from the beginning!